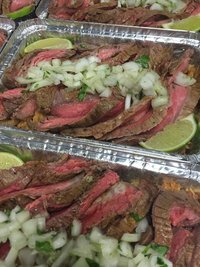 Marinated flank steak seared and topped with onions, chopped cilantro and a squeeze of fresh lime juice. Served over Mexican rice. This dish is NOT spicy. Lower carb alternative: black beans and corn. Please indicate your preference for the veggie side dish. Otherwise, we will assume rice. You can also order the black beans and corn as an additional side dish for $2.50 per person. This dish will come to you on the rare side so you can reheat it to your desired level of doneness. 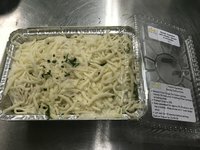 $14.50 for one serving. $27 for two servings. $52 for four. Cheese ravioli layered with chicken, Italian cheeses, spinach and artichokes and a tasty cream sauce. This is a “take and bake” item that will also freeze well. $17.50 for a 8.5″ X 6″ tin (2-3 servings). 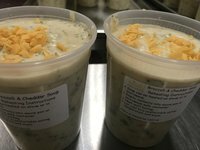 Thick, creamy soup with lots of broccoli and a blend of cheeses. $18 for a 32 oz container (four 8 oz servings). Just heat up in the microwave or on the stove. It also freezes well.